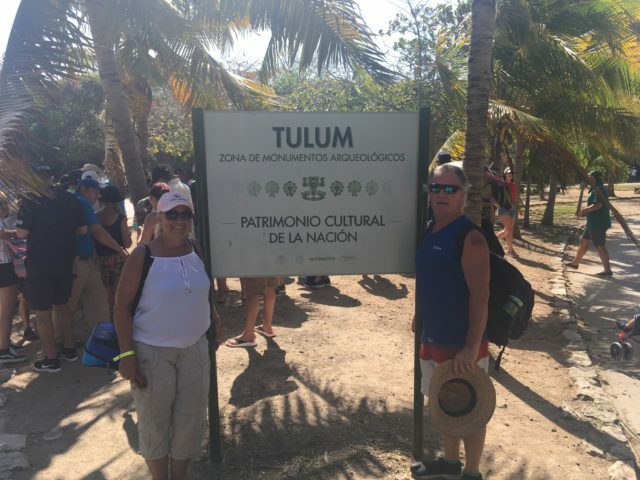 We recently took an opportunity to visit the Mayan Ruins in Mexico – Tulum and Coba. I want to share some things we learned on this trip and how our journey in life has some parallels. While many people visit the ruins on their own, we decided that since we had friends visiting for a short time we should take a guided tour. The cost was $55 US per person and included a buffet lunch. Our day started out around 8:30 in the morning in Puerto Morelos where we met the driver and one other person. We had our backpacks with suggested items – sunscreen, bathing suits, sturdy shoes, hats, water, and of course our sunglasses which we were already wearing. There were six of us altogether – the driver, a young woman named Kathy from Hungary, and our party of four. The sun was shining and everyone was in a carefree happy mood. Our driver was friendly, our vehicle comfy and air-conditioned, and the time passed quickly. With one stop on the way to take a bio break and pick up some coffees/water, we arrived about two hours later at the beginning of our journey. (That’s hubby and I by the sign to the entrance.) It is about a 10 minute walk to the entrance to the ruins; if that sounds tiring, there is a tourist train available. This would also be the time to take advantage of the washrooms before heading to the ruins. Tulum (original name Zama which means ‘place of the drawing sun’) is a resort town on Mexico’s Caribbean, approximately 130 km south of Cancun and 65 km south from Playa del Carmen. The word Tulum means ‘wall.’ Taking you back to the 13th century, the archaeological site at Tulum overlooks the sea on 39 foot cliffs along the east coast of the Yucatan Peninsula. It survived about 70 years after the Spanish began occupying Mexico. Diseases brought by the Spanish settlers caused high fatalities resulting in the abandonment of the city. It is believed that Tulum was an important site for worshipping the Diving or Descending God. Three main structures of interest are El Castillo, the Temple of the Frescoes and the Temple of the Descending God. El Castillo was built on another building that was colonnaded with a beam and mortar roof. Serpent motifs are carved into the lintels (structural horizontal blocks that spans the space or opening between two vertical supports) of the upper rooms. It has also been called the lighthouse. It is suggested that El Castillo was built in stages. A small shrine appears to have been used as a beacon to guide incoming canoes. This may also have been why Tulum became a prominent trading port. The Temple of the Frescoes contained a lower gallery and a smaller second story gallery and was used as an observatory for tracking the sun. The temple is decorated with ‘diving god’ or Venus deity figurines. The ‘diving god’ is positioned above the entrance to the western wall and is stil preserved. There is a mural on the eastern wall called Mixteca-Puebla but visitors are no longer allowed entry. The temple of the Descending God consists of a single room with a door facing the west and a narrow staircase built on top of another temple and was used as its base. Above the door is a sculpture that can be found throughout Tulum. It has wings, a headdress, and is holding an object. He is shown as being upside down. Tulum isn’t the only place this figure is found – it is also found in Coba on a small temple on top of the Grand Pyramid. It is also associated with Venus which in turn was associated with war and fighting. 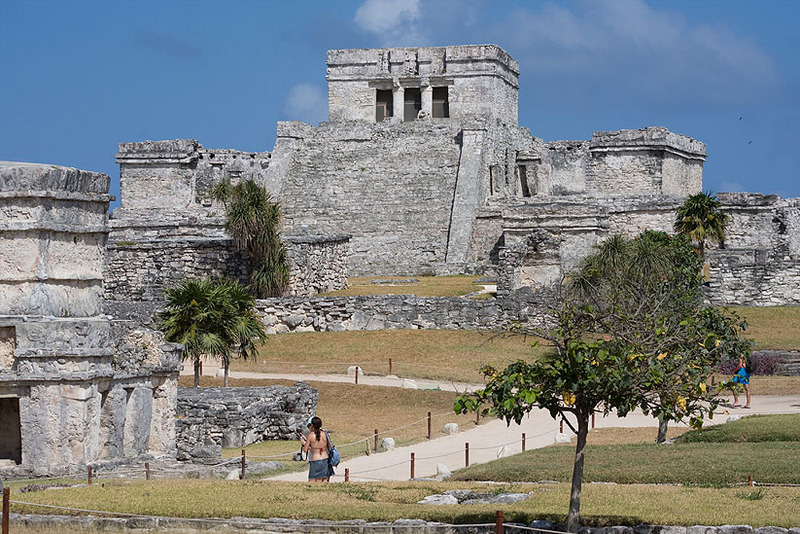 Tulum is one of the best preserved Mayan sites and is very popular among tourists. They are the third most- visited archaeological sites in Mexico after Teotihuacan and Chichen Itza, with over 2.2 million visitors in 2017. Before we headed on to Coba, we stopped and had a delicious buffet lunch which was included in the cost. This lake was across the road from the restaurant. 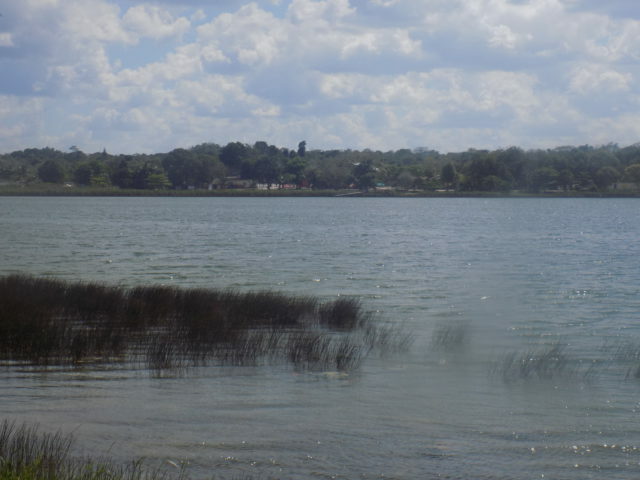 According to our guide, it is supposed to have lots of crocodiles but we didn’t see any. Not sure if this was true but we certainly kept our distance. Our next stop was Coba (which means “waters stirred by wind”) and I must say I found this ruin even more interesting than the Tulum ruins. Our guide pointed out that we should take photos of the Temple (Nohoch Mul), the Observatory and the “Ballgame” court. The site covers about 30 square miles with the ruins covering four miles. You can explore by foot but it will take several hours. We all took advantage of the chauffeured tricycles (125 pesos round trip for two) to get us between the buildings, otherwise we would have had a long walk. The Mayan site of Coba was set up with multiple residential areas that consisted of around 15 houses in clusters connected by elevated walkways (sacbeobs). Most of its construction was between 500 and 900 AD. At its peak of civilization, Coba is estimated to have had some 50,000 inhabitants; today, there is approximately 1500 inhabitants on the outskirts of Coba. 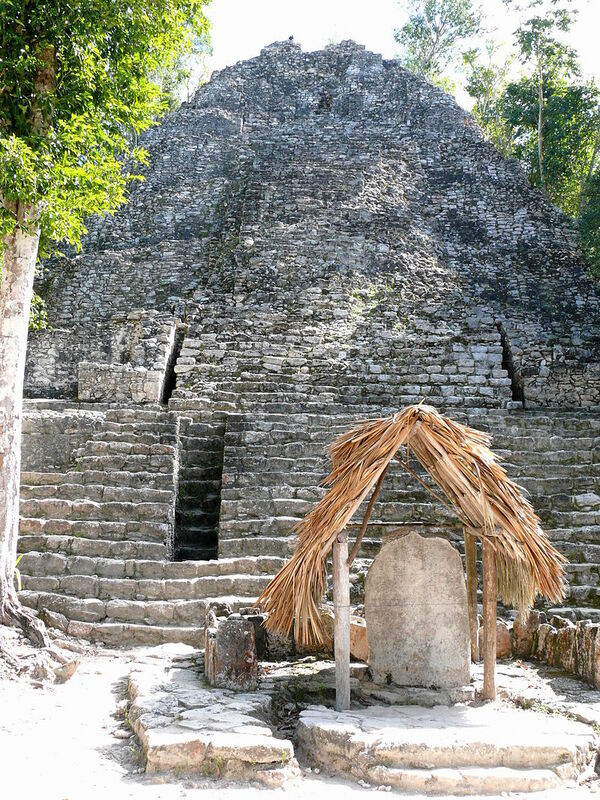 The Temple or great pyramid, Nohoch Mul, is the highlight of the Coba Ruins and one of the most significant and popular of the Mayan sites. It is a challenge for those who want to climb and reach the top but once there you will see a panoramic view of the surrounding jungle. Nohoch Mul which means ‘mound’ is 137 feet tall; it is the tallest Mayan pyramid on the Yucatan peninsula and the second tallest Mayan pyramid in the world (the largest pyramid known to exist in the world today is the Great Pyramid of Choula located in Choula, Pueblo, Mexico). If this is something you would like to do, you will have to take care as the steps are worn and slippery in places; there is a rope to assist you. Out of our group, Kathy was the only who ventured this climb (and she made it all the way – 120 steps!). My friend and I only went up about 10 steps so we could stop and have our photos taken. As Kathy climbed to the top, we were all encouraging her and cheering her on. This reminds me of our journey in life, where we are faced with challenges and obstacles. How good it feels when we are fortunate enough to have someone in our corner willing to cheer us on and encourage us to reach our goals. Kathy’s goal was to reach the top and she succeeded. It was another of life’s lessons and came at an unexpected moment. La Iglesia church is the second tallest building in Coba, standing at 74 feet. This is where the religious ceremonies were held. It is believed that it was built during the Late Classic Period which was 500 to 900 AD. Although not much is written about the Observatory, it appears this building was to keep track of the movements of the sun, moon and stars as well as synchronizing the calendars. It had a circular base instead of rectangle like the pyramids. Another interesting area is the ball court which was used mostly for ceremonial games. The Coba ball courts have inclined walls. Only certain parts of the body were allowed to be used – hips, shoulders, knees and elbows but not the feet, hands or head. A heavy ball was used weighing about 6 to 8 pounds and put through a stone hoop or goal, similar to basketball. Our guide told us that the winner was sacrificed and there was “death in winning” but some experts believe that it was the loser instead who was the sacrifice and had his head cut off. An important feature of the Coba Ruins is the engraved and sculpted Stelae – inscriptions and hieroglyphics in limestone used to decipher the ceremonial life and important events of the Mayan culture during the Late Classic Period (AD 500-900). Women are the figures of authority in many of the scenes on the stelae. Unfortunately, today, they cannot be deciphered because of natural erosion. After the ruins we went for a refreshing swim in one of the cenotes in Coba. 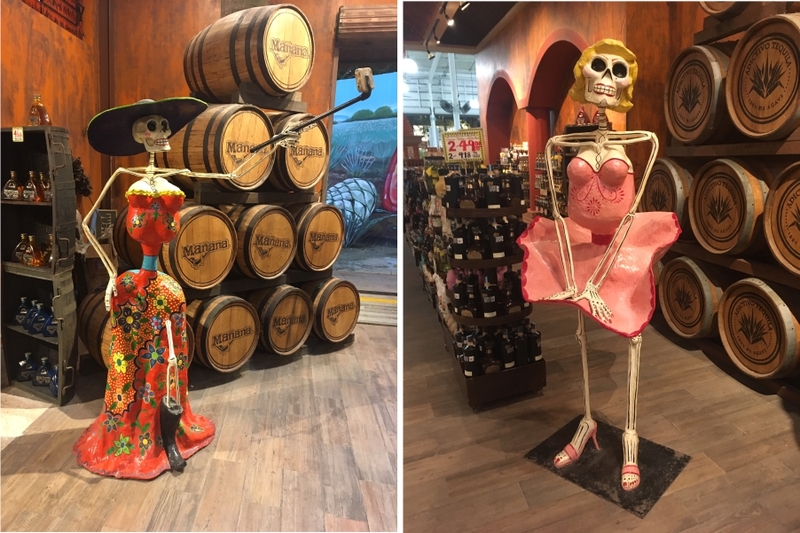 On our way to the Cenote, we passed many stores laden with handcrafted items. If you have a car, it might be fun to check them out. A cenote is a natural sinkhole, resulting from the collapse of limestone bedrock that exposes groundwater underneath. Especially symbolic of the Yucatán Peninsula of Mexico, cenotes were sometimes used by the ancient Maya for sacrificial offerings. Unfortunately, I didn’t take the opportunity to explore the Cenote (being a non-swimmer has its drawbacks) but look how beautiful the water is! The last part of our trip ended up with a tequila tasting in Playa Del Carmen. Although I am not normally a tequila drinker, I have had my fair share here in Mexico. One of my favourites was one that was coffee based, smooth and creamy. After spending some time tasting and wandering around looking at the various souvenirs on offer, it was finally time to call it a day and head back to Puerto Morelos. Our guide told us the best days to visit the ruins are a Monday or Tuesday as the crowds would not be as thick. The ruins themselves are about 3 km from the centre of the Town of Tulum. For us, hiring a tour guide was the easiest way to go. However, there are other options which I will briefly touch on here. There are lots of places to rent a car for the day. 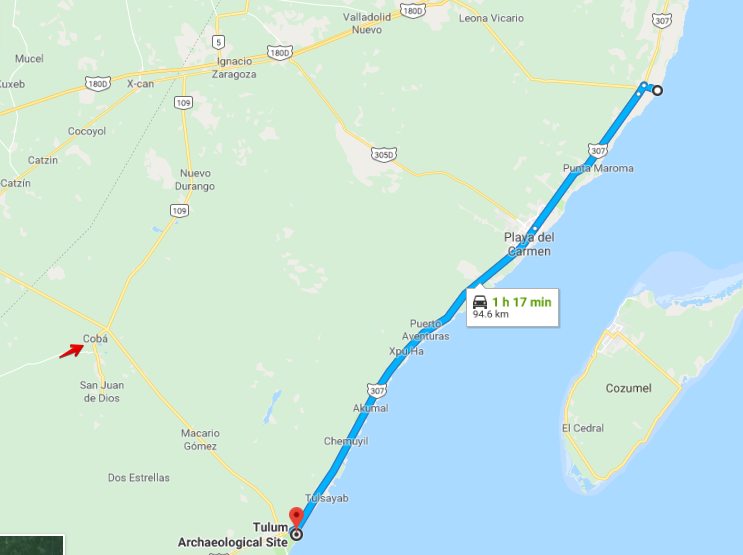 Follow the 307 highway from Cancun which will take approximately 1 hour and 45 minutes or from Playa del Carmen which is approximately 45 minutes. Parking costs are inexpensive. The ADO bus travels from Playa del Carmen to the ruins and will cost you about 80 pesos which is approximately $4 US and $5.50 Canadian, one way. It will drop you off near the ruins or you can go into town and take a taxi from there. These are big, comfortable, air-conditioned buses. The Collectivo is like a small bus and probably the cheapest way to go. You can ask the driver to drop you off at the ruins on the highway. You will have a little walk ahead of you but for the price of the Collectivo you can’t beat it. You have the option to take a taxi which is a bit more expensive and will cost you approximately 600 pesos ($30 US or $42 Canadian). While most taxis charge the same, there will be the occasional one that charges more – sometimes you can haggle with them, but don’t be unreasonable. If you choose to do this, there are several companies that offer this service and the prices vary as do what is included and not included in the tours. A couple of these are: We Love Puerto Morelos Tours and Cancun Adventure Tours. 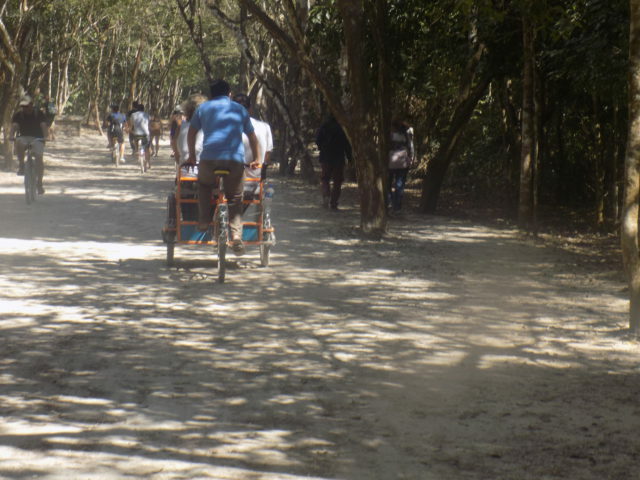 Getting to Coba is easier if you are part of a Tour group (our tour to the Tulum Ruins included the Coba Ruins) or you could drive. From Tulum it is approximately 45 minutes. Although not as famous as Chichen Itza, Tulum is one of the best preserved Mayan sites and is very popular among tourists. They are the third most- visited archaeological sites in Mexico after Teotihuacan and Chichen Itza, with over 2.2 million visitors in 2017. 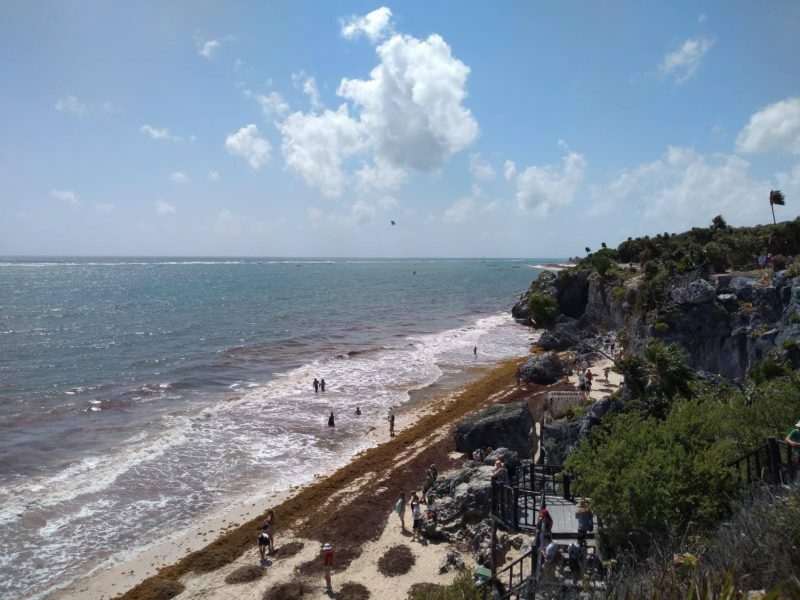 Coba had over 702,749 visitors in 2017. Part of this attraction is Nohoch Mul which can still be climbed today, unlike Chicken Itza. 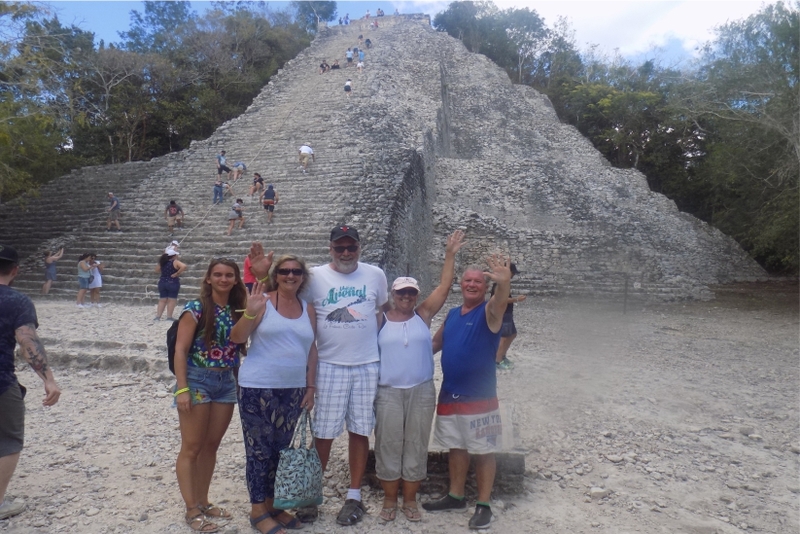 This was a great way to travel back through time to the 13th and 14th century and learn a bit about the Mayan Ruins in Mexico, the people, culture and what their beliefs were. If you decide to visit, I am sure you won’t be disappointed. 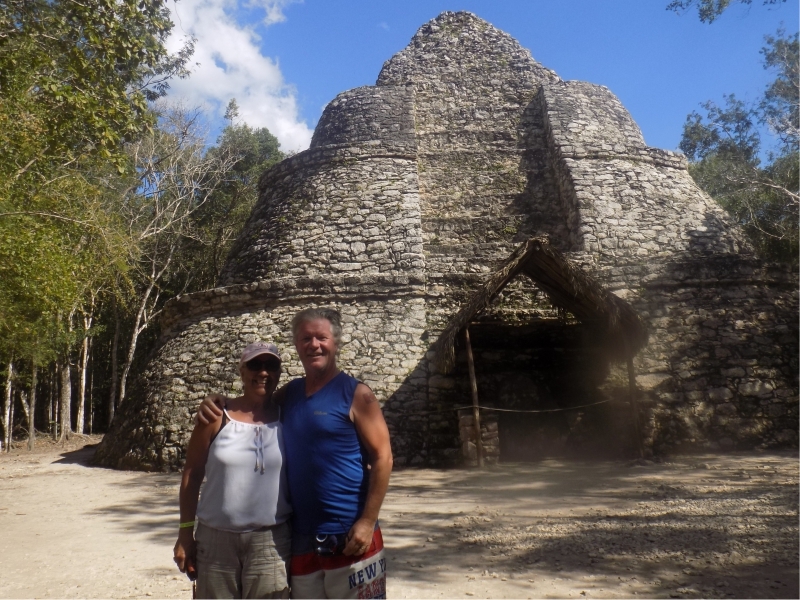 Note: If you have the travelling bug but not the dollars and want to see such wonders as the Mayan Ruins in Mexico, then house sitting might be the way to go. My husband and I are house sitters and have house sat extensively but are thinking about travelling to and house sitting in other countries. This is a fun way to see places and experience adventures. Go to our website to read about some of our sits. We love it! Check it out. You might too!! Have you experienced the Mayan ruins? We would love to hear about your adventures. Sounds like you had a fantastic time! 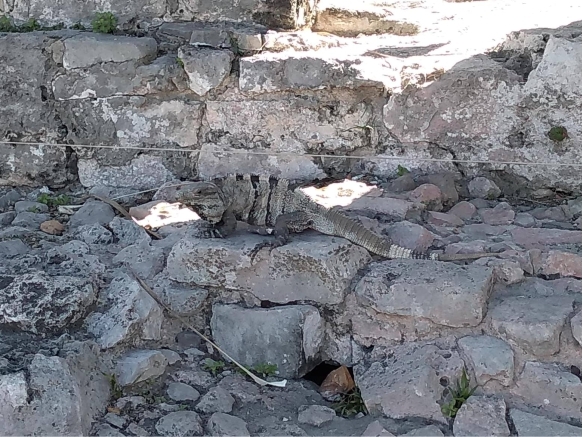 I definitely envy you as I have always wanted to check out the Mayan ruins (among other wonders!) so I pretty much devoured your write-up. I can’t say I have ever done anything near this cool but I’d like to! I guess it’s never too late to get started, right? Hello there,I hope that you are well. I saw your article in the search results that talks about the Mayan Ruins. The heading really captured my interest, however, I was a bit disappointed. The main reason as to why, is that when I tried to click on the link it told me that Google is trying to find the page. I am sure that the article would have been an interesting read. Could you please check it out, and let me know when it’s up and running as I look forward to reading it. Hi there. I am not sure why you were unable to view the article. Other people have commented on it without any issues. I will add the link here – hopefully, it will work for you. Travelling is very good and interesting, most likely the part that you will meet difference people with difference culture and also it’s good to meet friends and relative afar off. Assuming you didn’t travel to Tulum and coba now you wouldn’t have gotten this experience. You are even lucky that the vehicle you entered with other 6people is air-conditioned which make your journey enjoyable. Anyway thanks for the article. You are welcome Chris. Having an air-conditioned vehicle on such a hot day was indeed welcoming. Tulum and Coba are very interesting ruins and the next time I see them, I would love to rent a car and take my time.